Steak 'n Shake is famous for its steak burgers and hand-dipped milk shakes, but one location had to stop serving all that famous food for 24 hours last week. 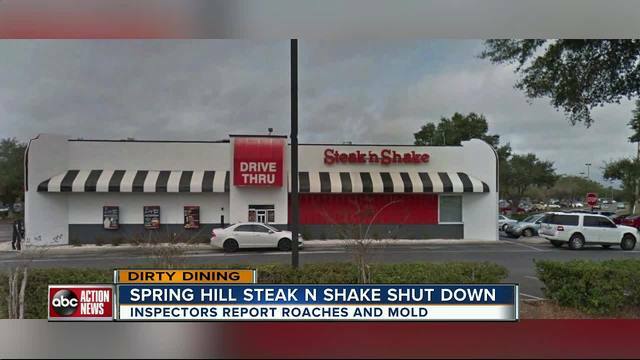 In a special Dirty Dining report, we uncovered that on June 14, inspectors shut down Steak 'n Shake at 4305 Commercial Way in Spring Hill after seeing live roaches on the cook's line, under the grill, near the warm holding drawers and at the drive-thru area. Other serious violations found include black/green mold-like substance on and around the soda dispensing nozzles and old food debris and grease on the grill, cooks line, hood filters, under shelving at the drive thru area, at the ice cream station, on the syrup jugs, candy containers, soda machine, front counter, and more grease accumulated on the kitchen floor and under the cooking and kitchen equipment on the cook's line and at the waiter's station. And just four months ago, inspectors discovered Chili not properly cooled and at a dangerous temperature in the freezer. And in the cooler, the state found shredded cheese at 47 degrees and cut tomatoes at 47 degrees when all cold food should be 41 degrees Fahrenheit or below. On February 22, inspectors also documented other violations: the dish-machine not sanitizing dishes properly and required Steak 'n Shake to begin manually washing dishes until it was fixed. They saw a cook failing to wash his hands and repeat issues of food debris/dust/grease/soil residue on the reach-in cooler/refrigerator, walk-in cooler and walk-in freezer shelves, break room, ice cream station, drive-thru area, on the kitchen floor and under cooking equipment. ABC Action News anchor Wendy Ryan spoke to Steak 'n Shake's manager, Erin but he had no comment and told her to call the corporate office. Ryan left several messages for Jim Flannigan, the Senior Vice President of Marketing but he never returned her calls.